There’s something to be said about a film that deals in cliché. The kind of film that celebrates heroism and realizing one’s full potential, and only asks for a minor emotional investment as seasoning to a rehashed, unoriginal story. In the clearing stands a boxer and a fighter by his trade. Born of the streets but given the opportunity for greatness that he reluctantly embraces in the face of adversity. Absent from the ringside seat is the woman he loves. She is replaced instead by the berating coach who barks words of encouragement and hides a lifetime of resentment and broken dreams. No, my dear reader, I’m not talking about the new film Southpaw starring Jake Gyllenhaal. I’m referencing the original Rocky and the immortal words of the late, great Roger Ebert in his accompanying review. That quote was taken right from the heart of Mr. Ebert’s 1976 review of a boxing masterpiece – a review I might add that celebrates success in the face of unoriginality. If we’re to examine what makes a good boxing film, it’s inevitable that we’ll draw comparison to the likes of Brando and his timeless On the Waterfront and the aforementioned Rocky (as a standalone film and a series). While I’m not afraid to go toe to toe and slug it out with this style of film criticism, I prefer my own criteria – that is – if I’m emotionally invested enough to be throwing punches during the final boxing match, then it’s a good boxing movie. By this definition, the boxing drama Southpaw is a good boxing movie. Is it a superb film all around? No, there isn’t a snowball’s chance in hell this is getting a best picture nomination. If you want a summary in familiar boxing-movie terms, it’s like Rocky III with the final fight from Rocky II with a protagonist akin to Rocky in the original film. So overall not great, but it earns considerable points for the performance by Gyllenhaal and the occasional emotional gut punches delivered by director Antoine Fuqua. The story of Southpaw is actually very similar to the third installment of the Rocky saga as we find a fighter more or less at the pinnacle of his career. Jake Gyllenhaal plays Billy Hope – the reigning lightweight champion who at the opening of the film stands undefeated and celebratory after his most recent title victory. His is the “rags to riches” story of a young orphan who – in spite of his youthful run-ins with the law in Hell’s Kitchen – finds success in a boxing ring and gains the fame and fortune he struggled endlessly to attain. He’s surrounded by an entourage of childhood orphan friends and supported outside the ring by a beautiful wife Maureen ‘Mo’ Hope (Rachel McAdams) and his daughter Leila (Oona Laurence). After an unfortunate encounter with an up-and-coming rival boxer Miguel Something-or-other, Maureen is shot by accident and dies tragically in Billy’s arms. Feeling empty after the loss of his wife, Billy is then coaxed into a fighting contract by his shady, two-faced agent Mains who is played by the ever appropriate 50 Cent. Quick side note – this might be the most unintentionally funny castings I have ever seen. Anywho, Billy royally fucks up the deal, he’s sued by the ref whose nose he broke, and seemingly overnight he loses everything. In his distress, Billy resorts to his reckless former self and subsequently loses custody of his daughter. So long story short, the movie is about him giving it his all to heal himself and his family the only way he knows how – by boxing. Like I said – the story as a whole is nothing new. It’s the same boxing clichés, the same embellished tropes of the genre; it’s an old film spruced up for the boxing-starved masses. Oh, and it comes none-too-soon and well ahead of the November release of the next installment in the Rocky saga – Creed. Now, if we go back to the part where I said Southpaw was a good boxing movie, I feel I need to qualify that beyond my punch-throwing approval. I only feel compelled to launch my silent sparring in the dark of the theatre if I’m emotionally invested in the central character. Suffice it to say, Jake Gyllenhaal did not disappoint, and my flurry of punches was as frequent as it was futile. If you can get over the painfully unsubtle surname of “Hope”, the character of Billy is endearingly tragic. The beauty of Southpaw isn’t in its feel-good, overcoming-adversity style narrative – it’s in the poignancy of seeing a broken and beaten down boxer reduced to nothingness. Yes, we all know how the final fight is going to play out, but boy does Billy Hope take an emotional uppercut again and again in the aftermath of his wife’s passing. Despite his humble (and ridiculous) beginnings in movies like Bubble Boy, I firmly admire Jake Gyllenhaal’s growth as an actor over the past few years. Yes, he takes some questionable roles like the titular character in Prince of Persia, but as a whole he’s developing into one of the more talented lead actors working today. A case in point would be his immersive transformations between last year’s Nightcrawler and his role in Southpaw. The actor is almost entirely unrecognizable from one film to the other, but Gyllenhaal manages to craft two equally compelling characters. Additionally it takes commitment to undertake such a transformation from the skeleton-like Louis Bloom in Nightcrawler to the brooding physicality of a muscular Billy Hope. I mean we haven’t seen that kind of dedication since Christian Bale and his transformation from The Machinist to the Dark Knight trilogy. 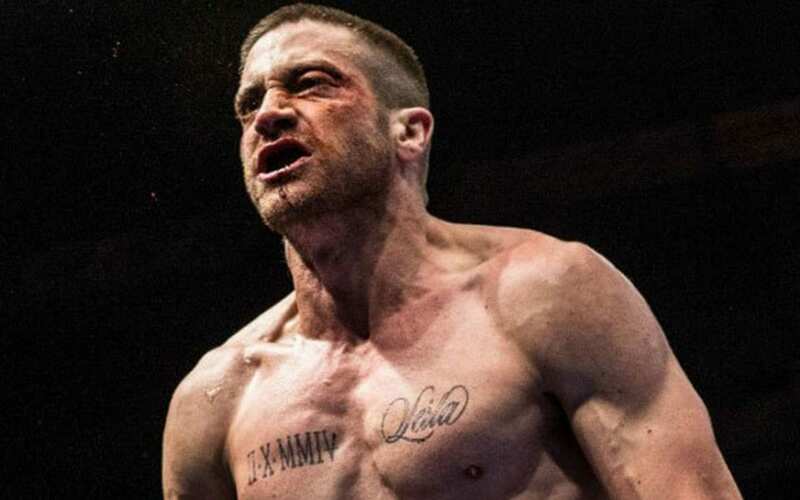 With the type of performance he delivers, any credit to the success of Southpaw rests entirely with Gyllenhaal. Considering the character of Billy Hope was originally going to be played by Eminem (insert your guffaws here), I think the world owes Antoine Fuqua a debt of gratitude for having the competence as a director to make the right casting decisions. It would not surprise me in the least to see an Oscar nod next February for Mr. Gyllenhaal – especially after his snub for Nightcrawler. Southpaw probably won’t be the spiritual successor to a classic like Rocky, but it still has a mildly compelling story. Gyllenhaal delivers a masterful, and transformative performance from his previous roles, and firmly holds up the film on his marbled shoulders. It’s a boxing movie, so you can already probably surmise the entire film from the trailer below. Either way, it’s arguably still one of the better movies this summer (since there isn’t any competition from the other blockbusters). Just ignore the entire supporting cast since they’re all fairly awful and focus on Jake Gyllenhaal’s performance. It’s well worth the $10. Oh and 50 Cent – because he totally plays a slime-ball boxing agent. Tell me that isn’t the most unintentionally funny thing to ever happen in a movie.